Throughout much of the western world more and more people are being sent to prison, one of a number of changes inspired by a 'new punitiveness' in penal and political affairs. 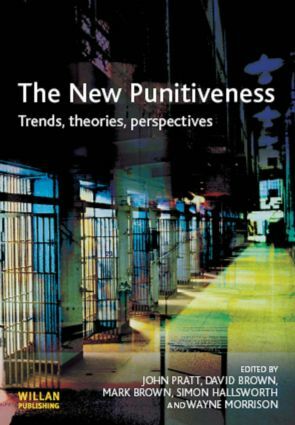 This book seeks to understand these developments, bringing together leading authorities in the field to provide a wide-ranging analysis of new penal trends, compare the development of differing patterns of punishment across different types of societies, and to provide a range of theoretical analyses and commentaries to help understand their significance. As well as increases in imprisonment this book is also concerned to address a number of other aspects of 'the new punitiveness': firstly, the return of a number of forms of punishment previously thought extinct or inappropriate, such as the return of shaming punishments and chain gangs (in parts of the USA); and secondly, the increasing public involvement in penal affairs and penal development, for example in relation to length of sentences and the California Three Strikes Law, and a growing accreditation of the rights of victims. The book will be essential reading for students seeking to understand trends and theories of punishment on law, criminology, penology and other courses.